I am already a fan of Milani’s, and I’ve always had a soft spot for werewolves who are not teen/angst/love characters, so I started off with high hopes, and I was overjoyed that the potential for a fun read was not only met, but exceeded. This was a good story that caught and transported me into a taut and well-paced story. OK, so the protagonist was not a werewolf of lore but rather a Lupan, a genetically modified being with genes of 20-some predators that had been crafted to make a race of super-warriors. Stuck running a bar on an independent station without extradition treaties with the worlds where he has a price on his head, Rick is safe from their reach as long as he stays to the station. But is he safe even there with station security breathing down his neck and searching for an excuse to take him down? With the obvious nod to Casablanca, Milani takes the story further, exploring subjects such as slavery and how people react to it. This was a fun ride, but it also had an underlying current of serious philosophy that lent the story more than a bit of gravitas. I totally enjoyed this story, and I wholeheartedly recommend it to others. 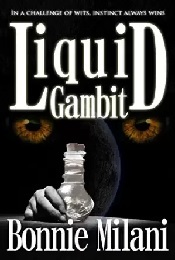 For more reviews or to buy Liquid Gambit from Amazon.com, click here.